Tweet Version 1.0 of CMON (gpl license) has now been released. It is dead easy to use and gives you a lot of helpful information about the state of the cluster. 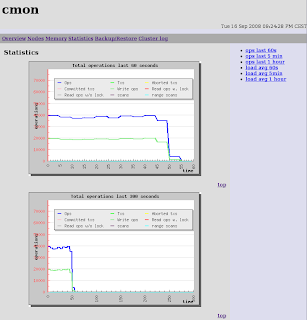 Memory utilization, statistics etc. 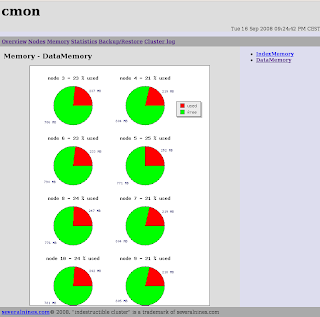 You can also get graphical representation using a web server and the php scripts that comes with cmon. If you use it with the new and improved config tool then you can setup a system with process management (monit) and init.d scripts etc in minutes, and cmon will then automatically coordinate the start procedures of the data nodes in the cluster! First you have to download cmon and then you can check out the documentation for it. The easiest and recommended way is to have a mysql server and a management server on the computer where you are installing cmon. This makes things simpler. automatically create a database called 'cmon' on the localhost the necessary tables. Sep 16 23:14:09 ps-ndb01 cmon: Table 'backup' did not exist. Schema incomplete. Going to recreate missing tables. 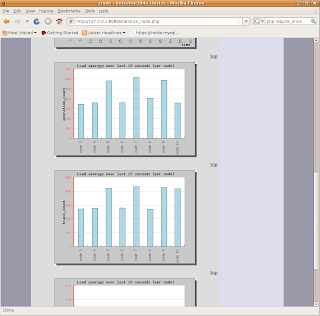 You are actually getting every stat you can get from MySQL Cluster at this stage. And if you don't want to use the PHP scripts, you can access the same information using plain SQL, since cmon logs everything to normal SQL tables. And yes, I have only tested this on Linux deployed on a cluster consisting of HP DL385 systems with x86-64 architecture (in this case dual cpu dual core Intel(R) Xeon(R) CPU 5160 @ 3.00GHz and dual cpu quad core Intel(R) Xeon(R) CPU E5345 @ 2.33GHz ). They are a bit old, but good. What is this file, where should it be and why it's not there ? Bu there is NdbApi.hpp in my system: /usr/local/mysql/include/storage/ndb/ndbapi/NdbApi.hpp . Which doesn't help much but I'm desperately looking for solution.